Nothing too unusual, expect the brace is clearly displayed and in use. I had wondered how far back the brace went, and this shows in in use back as far as 1427. The Mastermyr find had a number of spoon auger bits that dated the use back to roughly 1000 AD, but the wood bits all rotted away on that particular find and we don’t know what sort of mechanism was used to turn them. I would presume it’s something like the one show here. The other odd thing was the saw handle. It’s a straight rod, which does seem a bit uncomfortable. The teeth look to be cut on the push as well, but it’s hard to be certain that the artists painted this aspect exactly as it was seen. 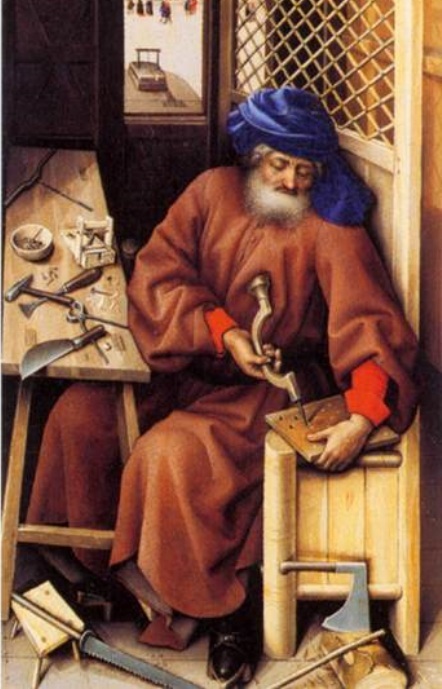 There is some good detail in all the tools that leads me to believe that he was painting from real life tools, but it’s hard to be certain on small details like saw teeth. Just something to scratch your head at I suppose.